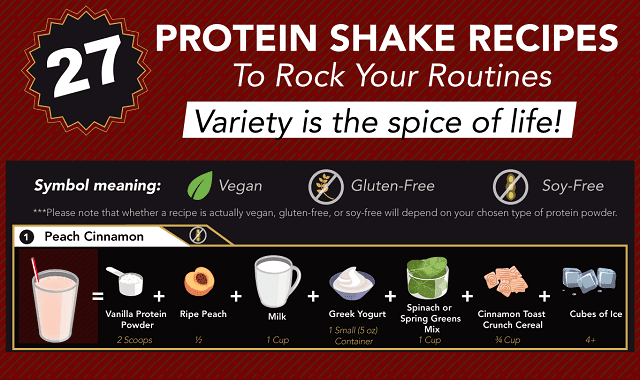 27 Protein Shake Recipes to Rock Your Routines #Infographic ~ Visualistan '+g+"
Lots of people who take their diet and exercise routines seriously use protein shakes. These shakes contain the extra nutrients needed to boost your body and help you see quicker, better results. But if you're just using the shake powder and nothing else week after week, you'll get a bit bored of the same old vanilla shake every day. And besides that, there's a whole world of fruits and vegetables that can be used to help boost your routine, too! So it pays – both the taste buds and the rest of the body – to experiment with new protein shake recipes. This infographic has a list of 27 of them for you to try. If you've got the right powders, you could do a different shake almost every day of the month if you wanted to! If not, it'll give you a new recipe every week for the next year! It's a diverse list, too – everything from peach cinnamon to mocha banana, from key lime to orange creamsicle! Maybe it'll inspire you to make your own recipes, too!